The Global Volcanism Program has no activity reports for Khodutka. The Global Volcanism Program has no Weekly Reports available for Khodutka. The Global Volcanism Program has no Bulletin Reports available for Khodutka. Khodutka stratovolcano was formed during the late-Pleistocene to early Holocene SE of an older stratovolcano, Priemysh. At least 10 explosion craters, small lava cones, and lava domes are located along the flanks, and Holocene cinder cones produced by regional basaltic volcanism occur to the west. 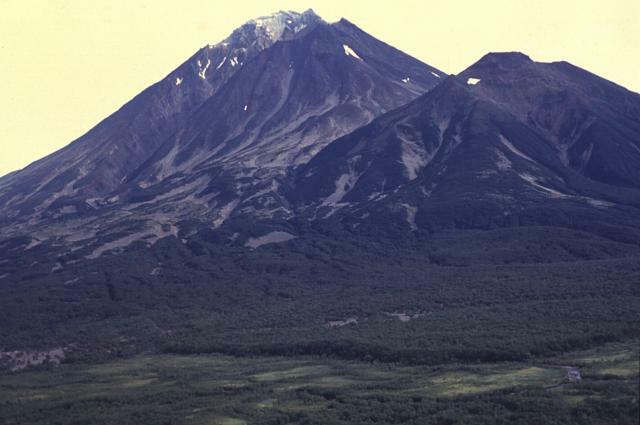 The Khodutkinsky maar on the WNW flank was created about 2800 years ago during an eruption that deposited tephra across much of southern Kamchatka. Formation of the twin maar was accompanied by small pyroclastic flows and followed by the emplacement of lava flows and domes. The last dated eruption took place from the summit vent about 2000-2500 years ago. The Khodutka Springs geothermal field occupies an explosion crater on the NW flank of Priemysh volcano. Kirsanov T P, Melekestsev I V, 1984. On the origin and age of Khodutka thermal springs. Volc Seism, 1984(5): 49-59 (English translation 1988, 6: 711-725). Melekestsev I V, Braitseva O A, Bazanova L I, Ponomareva V V, Sulerzhitskiy L D, 1996. A particular type of catastrophic explosive eruptions with reference to the Holocene subcaldera eruptions at Khangar, Khodutka Maar, and Baraniy Amfiteatr volcanoes in Kamchatka. Volc Seism, 18: 135-160 (English translation). There is no Deformation History data available for Khodutka. There is no Emissions History data available for Khodutka. The late-Pleistocene to Holocene Khodutka stratovolcano, seen here from the NE, was constructed to the SE of Priemysh, an older Pleistocene andesitic stratovolcano. The higher and younger Khodutka volcano is composed of more silicic, andesitic-to-dacitic rocks. Minor flank vents occur on the SW and north sides. The latest eruption produced a lava flow from the 2090-m-high summit crater of Khodutka about 2000-2500 years ago. 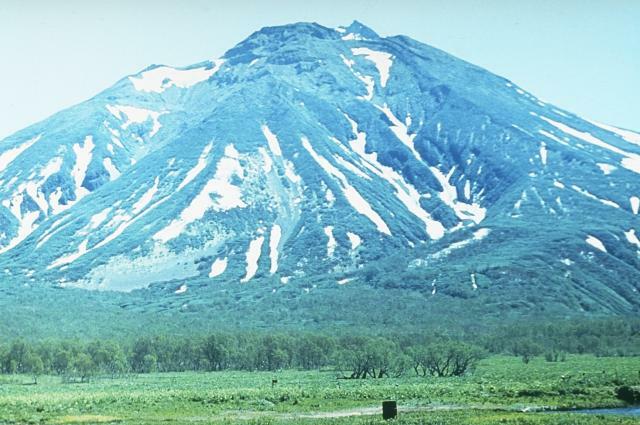 Khodutka stratovolcano (left), seen here from the north, was formed from the late-Pleistocene to early Holocene SE of an older stratovolcano, Priemysh, which forms the lower peak at the right. At least 10 explosion craters, small lava cones, and lava domes are located along the flanks of the Khodutka complex. The last dated eruption took place from the summit vent of Khodutka about 2000-2500 years ago. The Khodutka Springs geothermal field occupies an explosion crater on the NW flank of Priemysh volcano. Large Eruptions of Khodutka Information about large Quaternary eruptions (VEI >= 4) is cataloged in the Large Magnitude Explosive Volcanic Eruptions (LaMEVE) database of the Volcano Global Risk Identification and Analysis Project (VOGRIPA).